With that first chance came three things I desperately needed. If you guessed money, experience and the immediate need to develop patience you’d be right. Thank goodness I was able to get those three things sooner rather than later. I messed up a lot in those early years as I grew into my profession. With no experience how could one not mess up when new situations arose. There were times I wondered if I’d ever get it right. I’m thankful that during the early days of my first chance people were patient with me as I stumbled time and time again. No one ever said, “You’re just not going to make it kid…get out.” Sure, people knew I was raw but they didn’t want to see me fail. So they extended grace to me when I didn’t know what I was doing. They supported me in public even when I had done something wrong. They stepped in to provide counsel and direction through the difficult choices. And they provided more care and encouragement than I could have imagined. So why am I thankful for first chances? Because I got one. It provided for me in ways that go well beyond the financial. Have you ever needed (or wanted) a second chance – that opportunity to prove yourself again, or strive for something new or to make amends? Of course you have…because we’ve all failed. The Bible says so rightly that “all have sinned.” That means we are not perfect. We’ve all stumbled at some point and are in need of a second chance. In many ways second chances are harder for people than first chances. With a first chance you usually start with a clean slate on which to build. You get the benefit of the doubt from the person granting the chance that you can make something of yourself. That’s a lot to deal with. And the more chances needed the more those grow and become more challenging to overcome. I think people give second chances for one main reason: they’ve failed too and someone gave them a second chance. So why am I thankful for second chances? Because I’m going to mess up and need one. 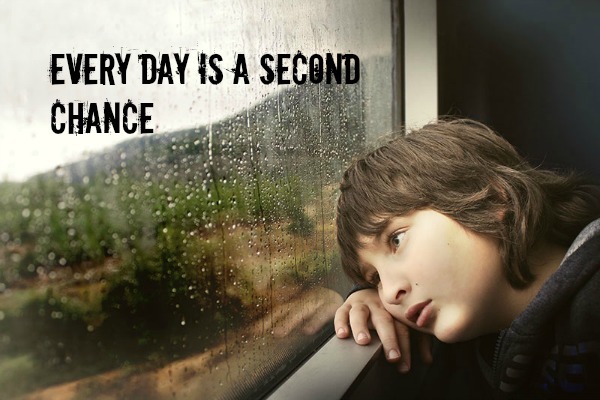 In reality, we all need and are usually granted many chances beyond just a second. I’m thankful for that too. I’m getting a second shot at a career, although not because I failed or messed up at the first one. My second chance came through a personal decision to change the course of my life. I do need multiple chances in other areas though because of mess ups. I’m sure my words will offend my wife or kids multiple times before the year is out. Thank goodness they’ll give me another chance with each ridiculous remark I make. Jesus wasn’t putting a limit (490) on the amount of times you can forgive. He was proposing that forgiveness should be endless. That’s tons of leeway for the opportunity at more chances. There is never an end to forgiveness. But there may be an end to the chances you might be given. Some behaviors are dangerous and intolerable. So guard your chances carefully. Consider each one another precious gift to get it right. This Thanksgiving be appreciative for the first and second chances you’ve been given. Make the most of them whether it’s the first, second or hundredth. Thank the people in your life who have given them to you despite your inexperience or the mistakes you’ve made. And if you are the one granting the first, second or the hundredth chance do so with generosity, remembering how many chances you’ve been given. Step into someone’s life with love, encouragement and guidance and help the succeed. I’m sure they’ll thank you for it. Questions: Do you remember your first big chance? What was it like…how did it go? Have you ever had difficulty moving on from mistake or failure as you sought some second chances? Who has helped you succeed and become more than what you thought possible? What are you most thankful for in regards to the chances you’ve been given? Nice post Brian. I think when given with another chance, we’d better be glad and take it with renewed hope and positive perspective that this time, we can really make things right. Great post, Brian! I am definitely grateful to those who gave me my first chance, especially when it came to my career as a financial advisor. As I’ve shared before, there were a fair amount of naysayers because women financial advisors were not very common (still sadly a problem today). I remember everyone who stood by and cheered me on my journey to where I am today. Wishing you and your family a Happy Thanksgiving, Brian! Sometimes all people need is a chance to prove themselves. That can’t come unless someone else is willing to take a risk and grant someone a first chance. Like you, I’m glad I’ve met some risk takers who opened a door for me. I think we all deserve a second chance. My only problem is when people don’t learn anything and need 25 chances all because of making the same mistake over and over again. “…when people don’t learn anything…” Agreed Cat. That certainly makes it difficult to keep giving chances. I have made many mistakes in my life and for me, the greatest blessing is the second chances and forgiveness shown by those we love. We are human and not robots so we are bound to make mistakes, but it is such a gift when we are given the opportunity to rebound from those mistakes that we made. “…forgiveness shown…” It’s a blessing when you receive that. We could certainly use more of this in our world.